Congratulations to the World Wide Web Consortium (W3C) for receiving a Technology & Engineering Emmy Award at CES this year for making video content more accessible with text captioning and subtitles. For the category “Standardization and Pioneering Development of Non-Live Broadband Captioning, " the Emmy Award recognizes W3C's Timed Text Markup Language (TTML) standard that addresses the needs of people with disabilities, particularly the deaf or hard of hearing. Producers of video content for the Web use W3C's TTML standard to author captions and subtitles that make online videos accessible to millions of people. MovieLabs is proud to work with the W3C to advance new TTML features such as TTML Profiles for Internet Media Subtitles and Captions 1.0 (IMSC1). IMSC1 is intended to simplify TTML implementation and authoring by bringing together popular TTML profiles in use in the industry, including EBU-TT-D. IMSC1 adds support for enhanced text padding, image subtitles and forced subtitles. Pierre-Anthony Lemieux (supported by MovieLabs) is the editor of IMSC1. 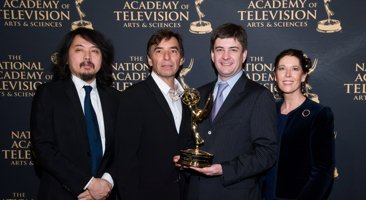 For more information about the Emmy ® Award and TTML, see here.